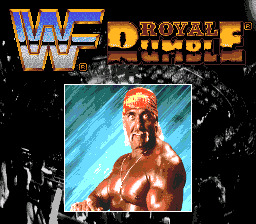 Play WWF Royal Rumble Now! In 1-on-1, you face an opponent alone. In 2-on-2 tag match, you team with a person to take on two opponents. In 3-on-3 tag match, it's like 2 on 2, but with 3 people on each team. Duh! In Royal Rumble, you must fight 11 other guys in an "over-the-top-rope" elimination match. The name speaks for itself. Opponents are thrown out by use of the tie-up and tapping the A button while near the ropes. In One Fall, it's a normal match, with count-outs and DQs. In Tournament, you face an opponent to advance on to face others. Gutbuster: Hold Down Press "A"+"B"
Hip toss: Tap "A", then when they approach you, Press "B"
Throw out of ring: Tap "A" near the ropes. Choke: Tap "A"+"B" Near them. Face Rake: Tap "A"+"B" At a distance. When your opponent's bar is low and red, you can use your finisher! When in the right position, press A + B to execute it to give your opponent a beating! It helps a lot!